Braintree was founded in 1995 in Australia and is currently operating in the UK. The I object is to promote hemp as ecological alternative to cotton. All garments are made with eco-friendly fabrics such as hemp, bamboo and organic cotton. The collection includes clothing for women and men such as pants, sweaters, shirts, socks and accessories. In 2017 they adopt a new name and Braintree Clothing becomes Thought. Available in two sophisticated colours, our Anson mens organic cotton shorts are a classic style for summer. 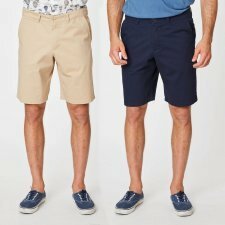 In a regular fit, these organic shorts feature belt loops and pockets at the side and back. Falling just above the knee, these classic cut shorts can be paired with espadrilles and a striped tee for a casual holiday look. Made of 100% organic cotton twill. The Anson mens organic cotton trousers are a classic style. 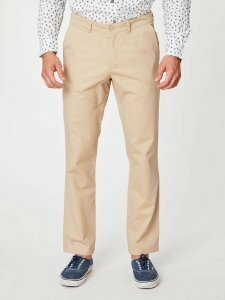 In a regular fit, these organic chinos feature belt loops and pockets at the side and back. Woman leggings made of 67% bamboo, 28% organic cotton, 5% elasthane. Available colours: purple, gray, lake green, black or navy (dark indigo). Our essential everyday tee is designed for easy layering. Cut to sit effortlessly against the skin in our gorgeously soft and supply bamboo spandex jersey fabric. Made of 67% bamboo, 28% organic cotton and 5% spandex jersey. Colours: white ivory/navy striped or dark grey/light grey striped. 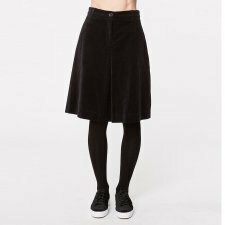 Gorgeous organic cotton velvet skirt. Made of 98% organic cotton cord and 2% elasthane. This luxuriously soft bamboo blouse is what we like to call an outfit-builder. 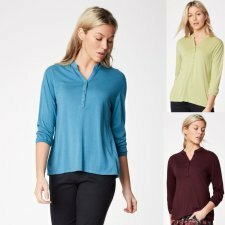 Designed to be worn with anything in the collection, this relaxed fitting blouse features a curved hem, long sleeves and a narrow stand-up collar. Colours: azure, aubergine or moos. In a luxuriously soft fabric, our Pavanne Blouse features a feminine, exclusively designed print. 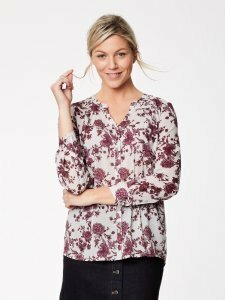 This unique piece is based on a best-selling shape, with long sleeves, a button placket at the front and a straight hem. Pair this relaxed fitting, organic blouse with your favourite jeans or trousers for a chic, daytime style. 3/4 sleeve top in bamboo. Made of 70% bamboo and 30% organic cotton. Colour: red, grey or mustard. If you have yet to try our bamboo tights let us tell you about their amazing properties. Made in our soft yet durable bamboo yarn, the tights have that cotton rich feel we all love, and the generous fit means there is extra length to sit comfortably over the waist. Made of 70% viscose derived from bamboo, 26% recycled polyester, 2% polyamide and 2% elastane. Bamboo dress falling just above the knee, comfortable pockets and long sleeves. This dress can be worn on top of legging or jeans. Bamboo slacks feature a wide, fold-over, elastic waistband, side pockets and simple cuffs. Perfect for light exercise and for relaxing at home. 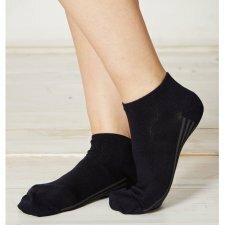 Made of 67% viscose derived from bamboo, 28% organic cotton and 5% spandex. Our Urwin cotton cropped cardigan is sustainably knitted from a durable organic cotton and hemp blend and is available in five new season colours. In a relaxed fit, this hemp cardigan features short sleeves, pointelle detailing, and front patch pockets. Throw it on over a floral top for a summery, daytime style. Colours: apricot, azure and white. 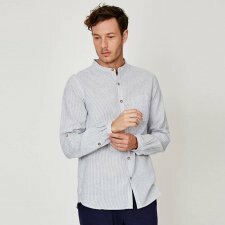 This casual grandad collar hemp shirt is a versatile classic style. The subtle stripe design gives an effortlessly cool and contemporary look. Fabric 55% hemp and 45% organic cotton. Our signature printed trouser has been updated with a new unique, exclusive print. 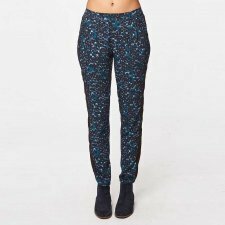 Elasicated at the back for ultimate comfort and easy wear, these trousers also feature functioning pockets. Made of 60% modal and 40% viscose derived from bamboo. 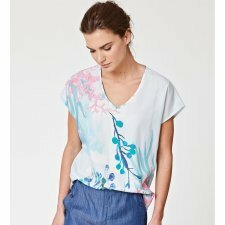 In a regular fit, our Coralium Tencel top features a unique, exclusive print. With grown on sleeves, this V-neck top is ideal for summer and can be worn with jeans or and sliders for an easy daytime look. 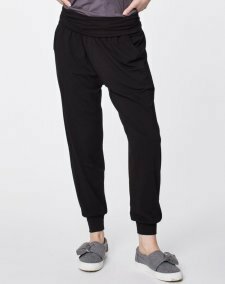 Relaxed and modern bamboo trousers come with 2 front pockets. 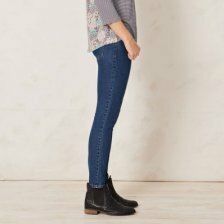 Forming an essential part of our collection the ever popular organic cotton denim jeans will move and mould to your individual shape. We've worked hard to ensure we can offer you a great fitting pair of organic cotton jeans. Made of 95.5% organic cotton, 3% recycled polyester and 1.5% elastane. Classic Model with 5 pocket, closure with zip and button. 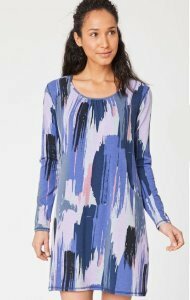 In a flattering, relaxed fit, our Coralium Tencel dress features an exclusive print, simple scooped neck and falls to the knee. 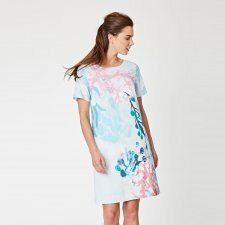 This floral shift dress is ideal for casual daytime dressing and can be paired with white trainers for a contemporary look. 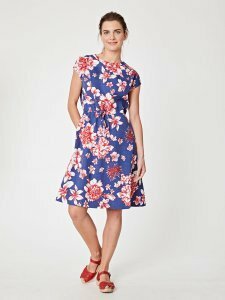 With a vibrant, exclusively designed print, our floral tie waist dress is sustainably made from Tencel and is perfect for summer occasion wear. With functional side pockets and feminine cap sleeves this unique print dress comes in a flattering fit. Pair it with sandals or heels for a smart day-to-night look.